Is the importance of English overstated? ... it would also be a big mistake to overestimate the reach of English. Though it is widely assumed that the planet is becoming more linguistically homogeneous, hard evidence suggests otherwise. Most of the approximately six thousand languages in use today are indeed spoken by relatively small communities, nearly half by populations of less than ten thousand. Although a great many of these idioms are in danger of dying, many new languages and dialects are coming into existence as well. 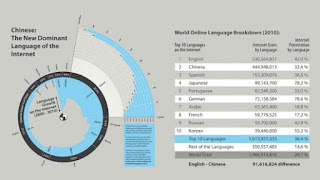 More broadly, there are a number of major world languages other than English, used by large portions of the planet’s inhabitants, in the context of dynamic social, cultural, and economic activities. Fifteen idioms are spoken by at least one hundred million people—including Spanish, Hindi, Arabic, Japanese, Portuguese, and French. At around one billion, there are more than twice as many speakers of Mandarin Chinese as of English. 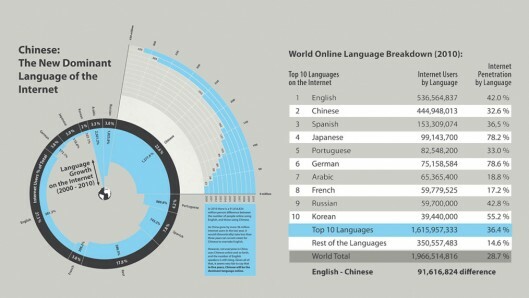 Chinese is almost as equally present on the Internet as English. India, home to the world’s largest film industry, produces movies in a staggering number of languages: in 2010 alone, 1,274 films were produced in a total of twenty-three languages—of these, 215 were shot in Hindi, 202 in Tamil, 181 in Telugu, 143 in Kannada, 116 in Marathi, 110 in Bengali, and 105 in Malayalam (and 117 films were dubbed from one regional language to another). Only seven were produced in English.